This Sunday, 6 December, will mark the 98th anniversary of the Halifax Explosion, which destroyed swathes of the Halifax dock yards and neighbourhoods on the north end and obliterated completely the community of Richmond. Halifax was in many ways North America’s hub for convoys crossing the Atlantic to England, carrying soldiers for the war, animals and much needed supplies. Before the explosion, Halifax was a booming wartime city; afterwards, it was a landscape reminiscent of the destroyed villages in northern France. 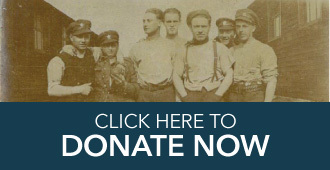 Many thought at the time that the war had finally come to Canada. Halifax was the departure point for thousands of convoys leaving North America throughout the war, making the harbour extremely busy. 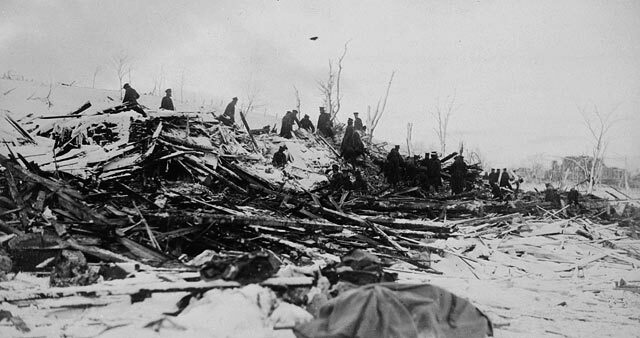 Though it was first thought to be a German attack or sabotage, the Halifax Explosion was the tragic result of human error. Like the Titanic, 5 years before, a series of decisions taken by various people resulted in the destruction of the city’s industrial heart. The explosion was the result of a collision between the French munitions ship the Mont Blanc and the Imo, a Belgian relief ship. The Mont Blanc was entering the harbour on the morning of 6 December after being delayed the night before at the submarine nets protecting the harbour entrance, which were closed during the night to prevent German submarines from entering. The Imo was running late leaving the harbour and had been caught up in the jam of shipping leaving the Narrows to join a convoy headed to England. The harbour was governed by a series of rules that dictated how ships were to enter and leave, the Imo entered the left hand side of the Narrows to allow an incoming ship to enter on the right, then stayed in the left to avoid hitting a tug boat, the Stella Maris, which brought it in a direct collision course with the Mont Blanc. Both ships captains veered in the same direction to avoid a collision, which caused the Imo to hit the Mont Blanc, hitting the holds carrying benzol and pricic acid, both highly flammable and highly unstable. The Mont Blanc’s additional cargo was TNT. The crew abandoned the ship, which was in flames, and rowed to shore, but was unable to warn the crowd on the docks or the harbour firefighters that the ship was going to explode because of the language barrier, they spoke French and the crowd spoke English. Aflame, the Mont Blanc drifted and ground ashore to Pier 6. At 9h04 that morning the ship exploded, sending flaming debris up to 5 kilometres away. Over 1 500 people were killed outright in the blast and the north end area of Halifax was leveled, burying inhabitants in the rubble. The aftershock of the blast caused a tsunami that rushed into the area around the harbour, further destroying buildings and killing those who survived the initial blast. Hospitals were overwhelmed and morgues struggled to deal with the bodies of those who were killed or later died. The harbour itself was largely destroyed and Halifax lost much of its industrial base, which was also near to the harbour. The convoy system ground to a halt until 11 December, but was quickly re-established and continued for the rest of the war, while the city struggled to provide temporary housing to the thousands of residents who had lost their homes and to rebuild its industrial centre, all the while investigating the possibility that the event had been sabotage. Much of Halifax would not be fully rebuilt until the 1920s. On 6 December at 9h05, the cannon on the Halifax Citadel will be fired in remembrance of the victims of the explosion.